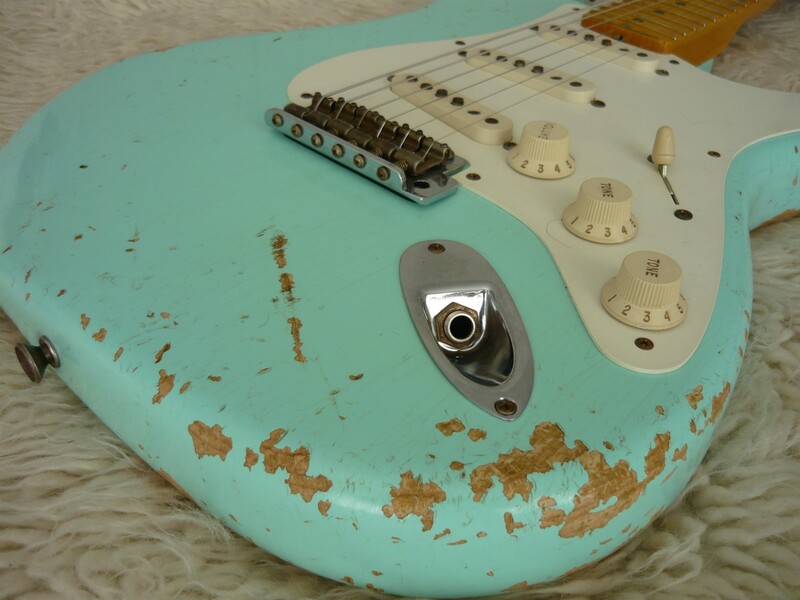 Fender Custom Shop Dealer Select Wildwood "10" '55 Strat Heavy Relic Limited Edition - Faded Surf Green. Slightly used, no fret wear, mint condition. Attention Fender Custom Shop fans. This sonic sledge hammer has a monster tone with killer vibe. Incredible natural sustain, big fat neck, the soul of a vintage guitar with the ergonomics of a modern guitar. Vintage vibe. Vintage Mojo. Tonal savagery. It is a rare model - limited edition built by the Master builders at Fender's Custom Shop. The John Cruz Limited single coil pick ups will blow you away. Absolutely stunning. Guitars Rock obsesses over guitars. This Strat is definitely right up there as one of the best tone machines to come out of the Vintage cupboard. It's historic, old school a true blast from the past. The relicing has been meticulously handcrafted by the Fender Custom Shop and is a pure work of art. Neck Shape: '54 Soft "V"